Another comedy set in the middle-ages? Seriously? From the peak of “Monty Python and the Holy Grail” to the low of “Robin Hood: Men In Tights”, we’ve seen it all. Really. We have. The makers of “Your Highness” tells us we’ve never seen the R-rated version. Now it’s here, and what “Superbad” screenwriter Ben Best and Danny McBride have cooked up with “Pineapple Express” director David Gordon Green is nonstop stupidity that decides too late that it needs to grow a heart (or so it seems). What “Your Highness” has on its side however, and it’s definitely not to be underestimated, is a pair of funny actors. That would be Danny McBride, who plays Prince Thadious, the cowardish younger brother of brave Fabious (James Franco), next in line to their daddy king (Charles Dance). Now Thadeous needs to prove himself, by helping his brother rescue his bride to be (a wasted Zooey Deshanel) from an evil wizard (funnyman Justin Theroux). Enter Natalie Portman, a female warrior who fights better than Thadious does (the dude’s an idiot), and isn’t shy when it comes to stripping naked by the river. The cast looks ready to rock. But the story just lies there, only a collection of vignettes that seem vaguely related to one another. One silly scene is followed by another. That’s one too many. Despite a couple of laughs, this movie is just not enough. 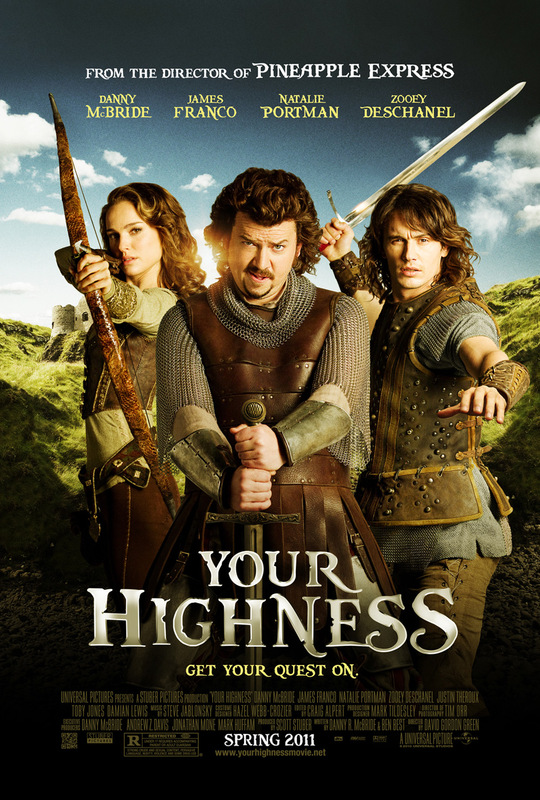 No matter, Danny McBride and James Franco make “Your Highness” seem a lot better than it is. Each earn a star in my review. The movie would be literally nothing without them. As for Natalie Portman and the talented Zooey Deshanel, what the hell were they thinking?